It is summertime and this year the living isn’t particularly easy in Texas. It is way too hot. So I am departing for cooler climates tomorrow and won’t be back to mid-July (yes, I know, it will still be hot). As always I will have my computer with me and if action is needed, I will communicate via Subscriber Alerts. Though I will note, that given the extent of equity overvaluation, it will take a hell of a selloff to prompt any action. The indices (DJIA 21409, S&P 2439) rose fractionally on low volume but slightly improved breadth. They retain their upward momentum as defined by their 100 and 200 day moving averages and uptrends across all timeframes. 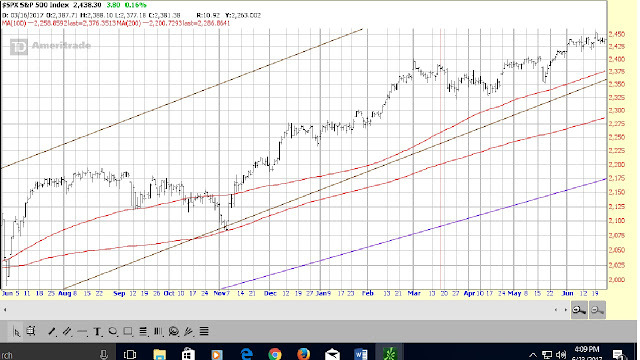 At the moment, I see nothing, technically speaking, to inhibit the Averages’ challenge of the upper boundaries of their long term uptrends---now circa 24198/2763. The VIX (9.9) fell another 1 ¼ %, ending below the lower boundary of its intermediate term trading range for the second day (if it remains there though the close on Wednesday, it will reset to a downtrend) and right on the lower boundary of its long term trading range. Remember that it has unsuccessfully attempted to reset both of these boundaries six times since mid-April. Odds suggests a seventh failure. 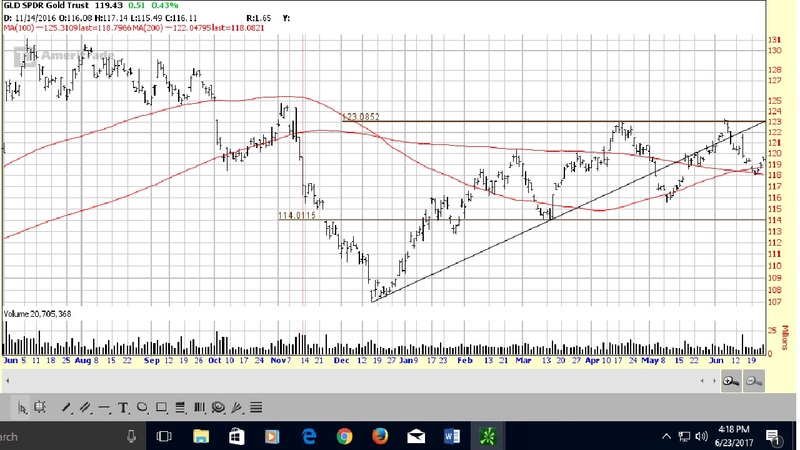 The long Treasury remains in a solid uptrend, finishing above its 100 and 200 day moving averages (now support), in very short term and long term uptrends and in a short term trading range---continuing to reflect bond investors’ doubts about a strong economy/rising inflation. The dollar rose slightly ($0.04), ending in a very short term downtrend and below its 100 and 200 day moving averages---also lending little support to the strong economy/rising inflation scenario. 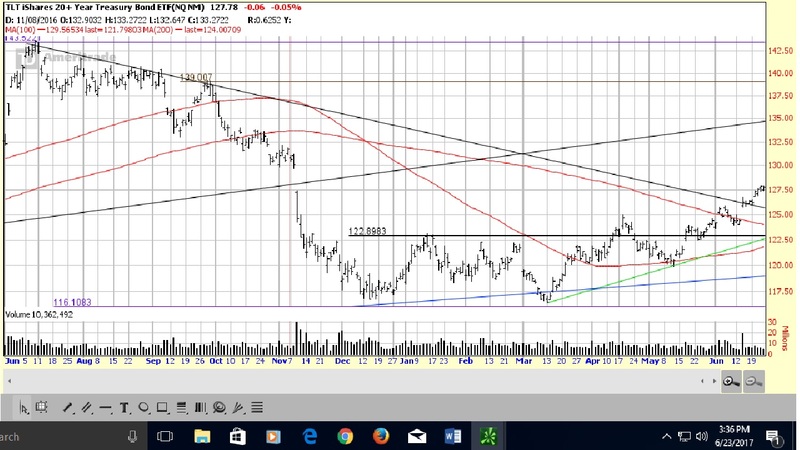 GLD declined, closing below the upper boundary of its short term trading range, back below its 100 day moving average, voiding Friday’s break but above its 200 day moving average. Bottom line: the Averages meandered through another lazy, low volume summer day, ostensively impervious to the data flow. That suggests that there are few concerns and, in general, everyone is happy with what they own. I have no insight into how long this lethargy will last; but it seems reasonable to assume that, technically speaking, the indices next big move will be to challenge the upper boundaries of their long term uptrends. The economic data got off to a very rough start this week: May durable goods, the May Chicago Fed national activity index and the June Dallas Fed manufacturing index were all disappointing---not the kind of follow through you want from last week’s improved stats. Overseas, the Italian government bailed out two failed banks---a plan that did not meet EU guidelines and called for the Italian taxpayers to put up $17 billion. Why is it that the taxpayers are always the one getting screwed? ***overnight, the Bank of England raised capital requirements on its banks. Plus, Draghi made some hawkish statements; and Yellen speaks today in London. In the US, the CBO released its much anticipated scoring of the senate version of healthcare reform. The major items include (1) 22 million will lose healthcare coverage by 2026 [23 million in the house version], (2) it will reduce the deficit by $321 billion over the next ten years [$119 billion in the house version] and (3) insurance premiums will increase in the first two years, then decline in the third year. So it is better than the house version but not a perfect bill. I would expect further improvement in the final senate version and still more when, as and if it reaches reconciliation. Who knows what the final product will look like; but some progress is better than no progress. So I think it too soon for the gnashing of teeth and tearing of hair. Bottom line: the numbers are not improving; and the Fed appears determined in its drive to tighten monetary policy. As you know, I am not concerned about the economic consequences of the latter but believe that it will impact equity valuations. As a result, I believe that every investor should have some cash reserves. It is impossible to buy low if you don’t sell high. Boeing (NYSE:BA) declares $1.42/share quarterly dividend, in line with previous. FactSet Research Systems (NYSE:FDS): Q3 EPS of $1.85 beats by $0.01. Revenue of $312.1M (+8.6% Y/Y) in-line. The June Dallas Fed’s manufacturing index came in at 15.0 versus expectations of 18.0. Visit Investing for Survival’s website (http://investingforsurvival.com/home) to learn more about our Investment Strategy, Prices Disciplines and Subscriber Service. There is not a lot of technically astute observations one can make about this chart except that the S&P is going up and there are no resistance points between current prices and the upper boundary of its long term uptrend (2763). The long Treasury (128) continues to act well. With its successful challenge of its short term downtrend, the next visible resistance is the upper boundary of its newly reset short term trading range (139). This positive pin action appears to reflect bond investors’ doubts about the strength in the economy. Although there is disagreement on that point. Now reverse everything I said about TLT. UUP continues to act lousy. Having successfully challenged the lower boundary of its short term uptrend, its next level of support is the lower boundary of its newly reset short term trading range. The only thing that is similar is that it also seems to be pointing to a weaker economy/lower interest rates. The good news for GLD is that it bounced up off its 100/200 day moving averages; plus it has made a third higher low. The bad news is that it has made two unsuccessful challenges of the upper boundary of its short term trading range. So while the GLD’s chart improved last week, I am now watching which resistance/support level is overcome first. The VIX (10.02) was off 4% on Friday despite it being a basically flat day; if it remains there through the close next Wednesday, the intermediate term trend will reset to a downtrend. That said, it closed below the lower boundary of its intermediate term trading range for the sixth time since mid-April, having been unable to successfully challenge that boundary on any of those occasions. Given that the all-time historical low close was 9 3/8, it seems likely that challenge will be no more successful than the prior six times. The economic data last week was quite positive and included three primary indicators (new home sales, existing home sales and leading economic indicators), two of which were positive and one neutral. That brings the score to: in the last 90 weeks, twenty-nine were positive, forty-nine negative and twelve neutral. While I will take good news over bad any day, (1) there were not a lot of stats last week and (2) at this point, it appears that the numbers were more of an outlier than the mark of a change in trend. So I won’t be altering our short term outlook. Another factor for the short term that I am watching is oil. It has been declining in price based on the economics of supply and demand; and given the negative impact on economic activity the last time prices fell markedly, I have no reason to assume that this time will be any different. That suggests yet another headwind for the economy. On the other hand, if the mounting political tensions within the Middle East OPEC members (Gulf States vs. Qatar; Sunni vs. Shi’a) suddenly become manifest in open conflict, it would likely reverse this downtrend in a nanosecond. Unfortunately, this scenario is likely less economy/Market friendly than declining oil prices. (1) the US banks passed the first stage of the most recent Fed stress test with flying colors. In my mind the real benefit of this is that the US economy is less apt to go into cardiac arrest once the economy/Market hits a speed bump as in 2008/2009. That said, if the banksters can persuade their bought and paid for political lapdogs to loosen Dodd Frank too much, it could provide short term economic benefits but would undo, at least, some of the gains in banks’ financial strength accomplished through those regulations. (2) the senate presented its version of a new healthcare bill. Given the tone of the news reporting, you may be wondering why I list this as a positive. And the answer is because we went through this exact same process after house announced it version of a new healthcare bill---DOA, split GOP, will kill millions and cost money, yada, yada, yada [I mentioned the bisque]. To be sure, any or all of those things could shut the process down; not to mention the dems relentless effort to investigate every corner of Trump’s life in the hopes of delaying/preventing the passage of the Trump/GOP fiscal program [not that he hasn’t brought a lot of this on himself]. So I am not getting jiggy here. I am saying that any step forward, however small in the implementation of that program is a plus. But, at this stage, it clearly does not warrant a review/upgrading of our long term secular economic growth rate assumption. Bottom line: nothing has changed in our short term or (recently improved) long term economic forecasts. The risks of a weak global banking system, an inefficient, economically debilitating fiscal policy, a completely f**ked up monetary policy, potential international confrontations, war, pestilence, famine and death (just kidding) remain with us as does a grossly overvalued equity market. You don’t need to run for the hills; but own some cash. May durable goods orders fell 1.1% versus expectations of down 0.4%; ex transportation, they rose 0.1% versus forecasts of +0.5%. The May Chicago Fed national activity index came in at -.26 versus estimates of +.32. Our daughter and her family arrive this afternoon for a weekend visit. So no Closing Bell. The indices (DJIA 21397, S&P 2434) drifted down in another slow day. They retain their upward momentum as defined by their 100 and 200 day moving averages and uptrends across all timeframes. At the moment, I see nothing, technically speaking, to inhibit the Averages’ challenge of the upper boundaries of their long term uptrends---now circa 24198/2763. Volume declined; breadth continued to weaken. The VIX (10.5) was off 2 ¾ %, leaving it between the lower boundaries of its intermediate and long term trading ranges on the downside and its 100 and 200 day moving averages on the upside. 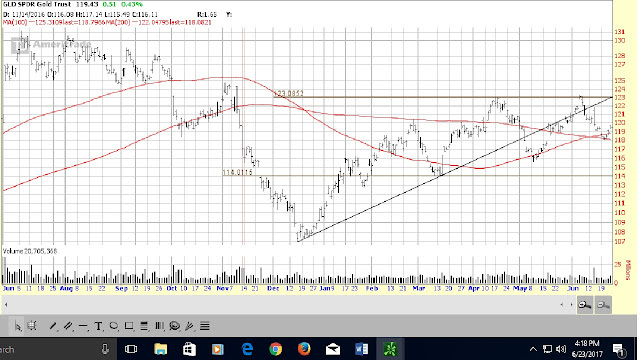 The long Treasury was strong again, finishing above its 100 and 200 day moving averages (now support) and in a short term trading range---continuing to reflect bond investors’ doubts about a strong economy/rising inflation. 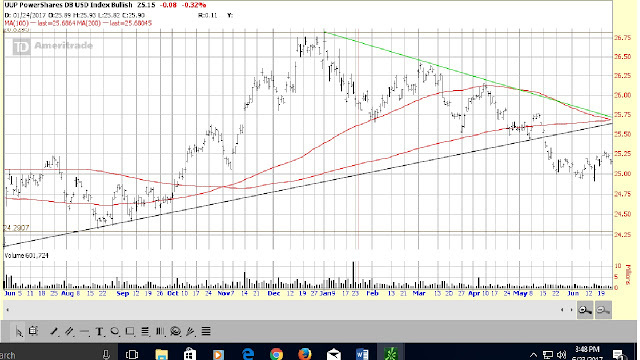 The dollar rose slightly ($0.01), ending in a very short term downtrend and below its 100 and 200 day moving averages---also lending little support to the strong economy/rising inflation scenario. GLD was up, closing below the upper boundary of its short term trading range, back above its 100 day moving average (if it remains there through the close Monday, it will revert to support) and above its 200 day moving average. Its price action around the moving average seems to indicate that some level of support has been found. Bottom line: the Averages meandered through another day, either apparently unimpressed with the pin action in bonds and the dollar, the implications of falling oil prices, another step in achieving fiscal reforms or suggesting that these factors are already discounted. Whatever the reason, technically speaking, the indices seem set to challenge the upper boundaries of their long term uptrends. Please be aware that today is Russell rebalancing day (the company rebalances the weightings of each stock in all its indices). That historically has meant a day of huge volume and some volatility. Yesterday’s economic data was mixed: both weekly jobless claims and the May leading economic indicators were reported in line with consensus while the June Kansas City Fed manufacturing index was ahead of expectations. (2) the senate revealed its version of healthcare reform. To be clear, this proposed legislation isn’t even out of committee, so it has to do that, then get approved by the full senate ,then get reconciled with the house version. So the timing and final shape of this potential reform remains uncertain. [b] as I read the narrative on this bill, it sounds more reasonable to me than the house version. So, my takeaway is that time has improved the product. That hopefully means that the final senate version and reconciled end product will be even better---the operative word being ‘hopefully’. To be clear, I am not tiptoeing through the tulips; but credit where credit is due. (3) the Fed released the first phase of its latest stress test. The results showed that all major banks passed and their capital was comfortably above minimum levels. As you know, one of the risks to the economy that I have focused on regularly in the Closing Bells is a vulnerable global banking system. However, over time as US regulators took firmer control of the financial system, the odds of any weakness occurring in our banks have diminished and with it the dangers of a 2008/2009 type financial crisis. The same can’t be said for most of the rest of the globe, so the risk remains. But the magnitude of any potential negative impact on the US banking system has lessened considerably. Bottom line: I thought yesterday was a positive one in terms of the long term outlook for the economy. We received further assurance that our banksters aren’t the risk to the economy that they were ten years ago---now if the political class can resist the bank lobbying effort for a major overhaul to Dodd Frank. But just to be clear, this does nothing to improve the growth prospects of the economy; it means that when the pain comes, it will not likely be as intense as experienced in 2008/2009. In addition, there was another step forward in the Trump/GOP fiscal reform, however small it may be. This GOP fiscal program theme had faded into the background recently as the Washington third world political circus held center stage; many thought that the dems may be able to severely delay or dismantle the reform progress (including yours truly). While I am sure their efforts will only redouble, I will take any step forward by the GOP as a plus. I am not revising our long term secular growth rate assumption; but at least I can hold to the possibility that it could occur. The bonus for the short term is that if (operative word) the reform effort can gain some momentum, the psychological effect on investors could contribute to a pickup in economic activity. But back to reality. However positive an impact passage of the Trump/GOP agenda would be on the long term secular growth rate of this country, its complete enactment is more than adequately reflected in stock prices. And I add the caveat that if its complete enactment were to mean higher national debt/deficits, then it would likely be a negative. My thought for the day: you don’t have to be an expert to be good investor. But as Dirty Harry said, you have to know your limitations and develop an investment strategy that reflects those limitations. Thinking through a change in asset allocation. The May leading economic indicators were up 0.3%, in line. The June Kansas City Fed manufacturing index came in at 11 versus the May reading of 8. The indices (DJIA 21410, S&P 2435) were off again yesterday, though not by much. However, it was enough to close Monday’s gap open---eliminating this factor as pressure to the downside. They retain their upward momentum as defined by their 100 and 200 day moving averages and uptrends across all timeframes. At the moment, I see nothing, technically speaking, to inhibit the Averages’ challenge of the upper boundaries of their long term uptrends---now circa 24198/2763. Volume declined; breadth was weaker though it remains in a positive zone. The dollar fell, ending in a very short term downtrend and below its 100 and 200 day moving averages and lending little support to the strong economy/rising inflation scenario. 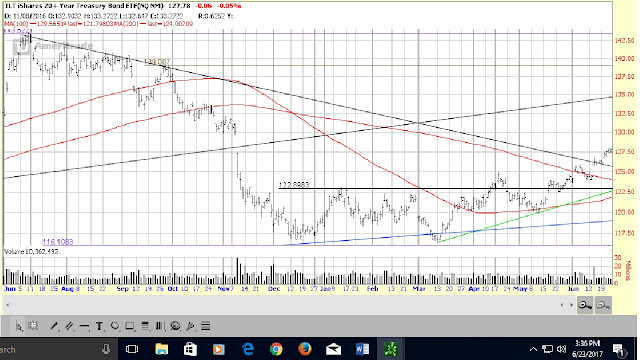 GLD was up, closing below the upper boundary of its short term trading range, below its 100 day moving average for the third day, reverting to resistance but back above its 200 day moving average---a slight improvement to an ugly chart. Bottom line: the Averages satisfied the need to close Monday’s gap opening, removing about the only technical factor suggesting lower prices. There seems little reason to be concerned about the long term, technically speaking, except for the troublesome decline in Treasury rates and the flattening yield curve. Yesterday’s economic stats were upbeat: May existing home sales were much stronger than anticipated; weekly mortgage applications were up, though purchase applications were down. Overseas news was highlighted by a reversal of Tuesday’s news: (1) the BOE’s chief economist directing contradicted [rate increases needed] the comments of head of the bank made the prior day and (2) China attempted to un-invert its bond yield curve. Bottom line: the numbers so far this week have been upbeat, though not enough to get me jiggy. Oil now has everyone’s attention, especially with respect to its implications for the economy. While some pundits are still trying to sell the ‘unmitigated positive’ line, recent history suggests ‘wishful thinking’. That said, if the rising geopolitical tensions in the Middle East lead to an escalation of violence, the price of oil could be the least of our worries. The rest of the news flow seems like white noise: the deteriorating relations with Russia, the coming senate bill reforming Obamacare, the implications of the GOP win in Georgia. Investors remain in a joyous mood and there is no sign that state of mind is going to end anytime soon. So enjoy the ride; but please exercise some discipline and take some profits. The only way that you can buy low is to sell high. My thought for the day: losses are simply the cost of doing business; it is the price you pay for the chance to make winning investments. The key is having the discipline to keep the losses small and knowing the price at which to take profits. It is not about being right or wrong, it is about being agnostic about everything except not taking big losses and letting profits run. Go to the gym and watch your expenses. Accenture (NYSE:ACN): Q3 EPS of $1.52 in-line. Revenue of $8.87B (+5.2% Y/Y) beats by $40M. Oracle (NYSE:ORCL): Q4 EPS of $0.89 beats by $0.11. Revenue of $10.9B (+2.8% Y/Y) beats by $450M. May existing home sales rose 1.1% versus expectations of a 0.3% decline. Weekly jobless claims rose by 3,000, in line. The indices (DJIA 21467, S&P 24373) fell back yesterday, but not enough to close Monday’s gap open. So we could see more weakness short term. Nevertheless, they retain their upward momentum as defined by their 100 and 200 day moving averages and uptrends across all timeframes. At the moment, I see nothing, technically speaking, to inhibit the Averages’ challenge of the upper boundaries of their long term uptrends---now circa 24198/2763. Volume rose slightly but breadth weakened. 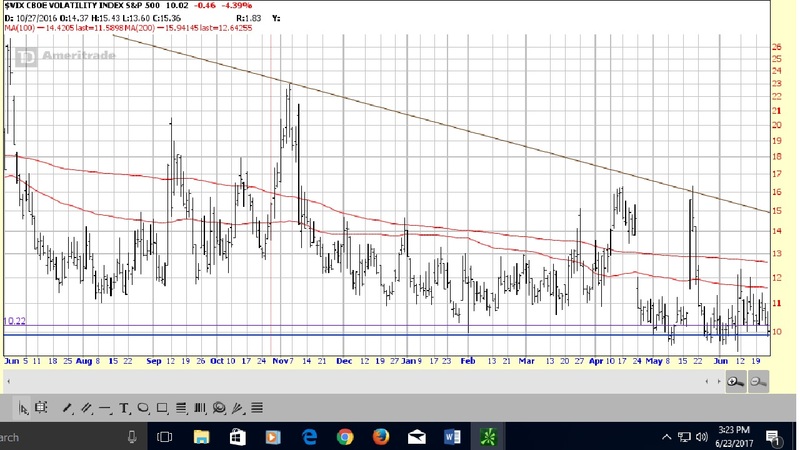 The VIX (10.9) was up 4 ¾ %, but remained between the lower boundaries of its intermediate and long term trading ranges on the downside and its 100 and 200 day moving averages on the upside. The long Treasury spiked 1%, finished above its 100 and 200 day moving averages (now support) and in a short term trading range---continuing to reflect bond investors’ doubts about a strong economy/rising inflation. The dollar was up but still ended in a very short term downtrend and below its 100 and 200 day moving averages. GLD was down again, closing below the upper boundary of its short term trading range and its 100 day moving average (if it remains there through the close today, it will revert to resistance) and right on its 200 day moving average. This chart keeps getting uglier. Bottom line: a short term retreat is not unexpected, given the need to fill Monday’s gap open. However, there seems little reason to be concerned about the long term, technically speaking, except for the troublesome decline in Treasury rates and the flattening yield curve. Two minor datapoints yesterday: the first quarter US trade deficit was less than forecast and the growth of month to date retail chain store sales rose from the prior week. Overseas, the news was not quite so positive: BOE chief said that now it is not the time to raise rates; Chinese yield curve inverts. ***overnight, the BOE is taking a page from the Fed’s playbook (on the one hand, on the other hand) as its chief economists says that it is time to raise rates. The only other mentionable item is the continuing fall in oil prices. Given history, I can’t believe that people bought into the OPEC production cut/higher oil prices thesis in the first place; and perhaps that thesis will prevail. But at the moment, it is suffering some severe heartburn. Plus, it still belies the notion of lower oil prices = unmitigated positive. Bottom line: aside from the news of Amazon buying Whole Foods and its new ‘try before you buy’ concept which have the Market all atwitter, the economic and political news flow is not what I would call upbeat---particularly the geopolitical goings on in the Middle East and North Korea. I have said this before; but at some point, bad news will be bad news. Clearly, I have no idea when. My thought for the day: I know lots of investors who spend hours doing their homework; then instead of following their work, they chase ideas/tips from friends or brokers. I probably don’t have to tell you which investments were the bigger winners. Bogle’s seven tips for investors. Month to date retail chain store sales grew faster than in the prior week. Weekly mortgage applications rose 0.6% while purchase applications fell 1.0%.